Designed to fit the Motorola Moto E5 Play. 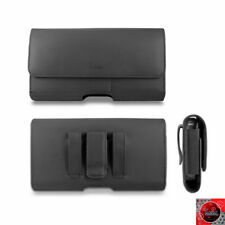 BLACK LEATHER HORIZONTAL POUCH CASE WITH BELT CLIP BELT LOOP MAGNET CLOSING FLAP AND ELASTIC ON THE SIDES THAT STRETCHES TO FIT YOU PHONE WITH A CASE ON. Bold & Impressive stitching. Sturdy, yet flexible Moto E 2nd Gen (won't Fit 1st Gen Moto E) TPU case is attached to the inside of the wallet. Made for the Moto E 2nd Gen (won't Fit 1st Gen Moto E) in a vibrant Black. Compatible Model: Moto E 2nd Gen (won't Fit 1st Gen Moto E). Motorola moto e5 Plus. These are high quality cases that will fit the Motorola moto e5 Plus. Fits the Motorola moto e5 Plus without protective cover on or with a thin slim protective cover case. This pouch size will be too small for the phone with thick cover case on. Flip style wallet Moto E 2nd Generation, 2015 (Will Not Fit 1st Gen.) phone case. Moto E 2nd Generation, 2015 (Will Not Fit Moto E 1st Gen.). Custom designed with a protective TPU case on the inside that is molded to perfectly fit your Motorola Moto E 2nd Generation, 2015 (Will Not Fit 1st Gen.) phone. Ideal for tradesman or people who doesn't like keeping phones in their pocket or bags. 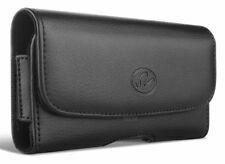 High quality leather case with belt clip and loop. For Motorola Moto G5 Plus 5.2' For Motorola Moto G5. For Motorola M oto G4 & G4 Plus For Motorola Moto G4 Play <-------------- Phone Cases for Motorola. Motorola moto e5 SUPRA. These are high quality cases that will fit the Motorola moto e5 SUPRA. Fits the Motorola moto e5 SUPRA without protective cover on or with a thin slim protective cover case.